Urinary Tract Infection is probably one of the most common ailments, which is both painful and annoying. Simply known as UTI, this affects both women and men; however, women are somehow more prone to this than men. From the name, you must have guessed which part of the body is affected by the condition. A urinary tract infection occurs when there’s a bacterial infection in your urinary tract. In the medical world, it is known by different names depending upon which part of the tract is affected. In case the lower portion of the urinary tract is affected, it is known as cystitis and in case the upper part is affected, it is called pyelonephritis. The symptoms of urinary tract infection in most women include an increase in your urge to urinate, and a painful burning sensation every time you try to urinate. Now these symptoms can range from mild to even severe depending upon the extent of your infection. Other symptoms also include fever, a pain in your lower back region or just above your pubic bone and nausea or even vomiting. Now antibiotics may be one way to go when it comes to curing UTIs, but you could take the safer route and try out home remedies for UTI. When it comes to something like UTI, you might try out allopathic medicines thinking it would get you quick relief for pain, but it is never advisable to pump yourself full of antibiotics. Well, that’s the reason you’re in this situation in the first place. If you’re wondering about how much water you should drink in a day, science says that you should at least drink water in an amount equivalent to that of half of your body weight. So if you weigh about 100 pounds, you should drink 50 pounds of water daily. If you drink sufficient quantities of water during an infection, you would be washing out or eradicating the harmful bacteria. Keep a bottle ready with you and keep sipping from it every few minutes. It’s probably one of the safest home remedies for UTI. Vitamin C, which is commonly found in citrus fruits, is a great way of killing the bacteria causing your urinary tract infection. In fact, a deficiency of this vital vitamin may even be the cause of such infections. What is the first thing that comes to your mind when you taste an orange or some other citrus fruit? It’s really sour, isn’t it? That’s because it is acidic. Vitamin C would help in increasing the acidity of your urine. With the pH levels of your urine changing, bacteria wouldn’t be able to thrive in your urinary tract. Urinary tract infection is painful; there is absolutely no doubt about that. In fact, all you’ll want to do during those few days is just lie down. You might be feeling a pain creeping down your back or near your pelvic region. To deal with it, you could use a heat pad. Applying heat has been scientifically proven to reduce any kind of pain. Make sure you keep the heat on the lower side and don’t let it come in contact with your skin directly; you don’t want burns, do you? A moderate amount of heat every few minutes would do you good. If you didn’t know this already, there are some food items which are bladder irritants and that is another problem you don’t need when you’re suffering from UTI. Yes, you can’t live without your cup of coffee in the morning, but during these six – seven days, you should cut out alcohol, caffeine, any spicy food, carbonated drinks, artificial sweeteners and even nicotine from you diet. Spicy food can further increase the burning sensation while urinating. Well, before you brush past this point thinking it’s useless, think about it logically. Every time you urinate, you’re getting rid of some of the bacteria that have accumulated in your tract. Anyway you would be getting the urge every few minutes, and that’s actually a good thing. Holding in your urine may have negative consequences. In fact, not urinating for long periods of time or holding it in is one of the common reasons of urinary tract infection. 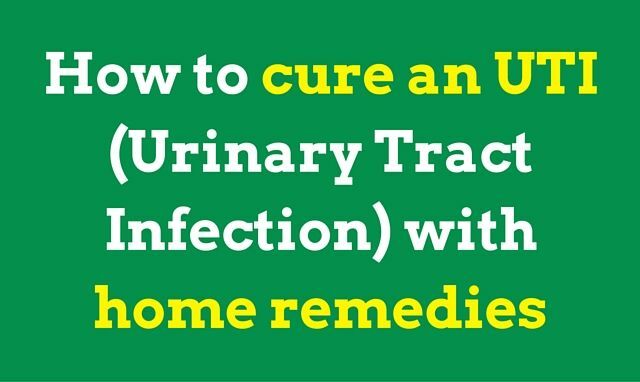 When you’re helpless and desperately searching for safe home remedies for UTI for curing urinary tract infections, you should try herbal remedies. There is a herb called bearberry leaf or urva ursi. According to naturopathic medicine, you can take this herb during you infection. But remember, you should have it for more than five days at a time because it could take a toll on your liver. Most of the herbal remedies are safe and don’t come with a bunch of side effects. This apple cider vinegar is full of potassium, enzymes and other such compounds which can help you get rid of the bacteria. This would also stop the bacteria from multiplying and worsening the situation. Apple cider vinegar basically functions as a natural antibiotic. You can mix this into a tall glass of water and drink it at least twice daily. If you’re not particularly fond of the taste, you could sweeten it with honey. This is a home remedy that even your grandmothers and great grandmothers would recommend to you. Cranberries have been used since time immemorial to cure any kind of urinary tract infection. There are certain components in cranberries, like proanthocyanidins, which can help you, eliminate the problem from within. If you’re not able to get fresh cranberries, you can even go for cranberry juice but make sure it is unsweetened. Drink about half a glass each day for a few times at least. However, have you had kidney stones before? Then you better try out the other home remedies mentioned here. This home remedy has been tried and tested a number of times. What baking soda does is it changes the level of acidity in your urine. Naturally, that creates an inhospitable environment for the bacteria in your urinary tract. Also, it would you hasten the usually long and painful recovery process and would also curb the pain. All you have to do is mix baking soda in water and drink it for a couple of days. You’ll see the difference for yourself pretty soon. You must have heard the elders in your family talking about tea tree oil. Apart from its antibacterial properties, tea tree oil is a very powerful antioxidant. You can mix a bit of tea tree oil with your bath water. There’s another thing you could do- add juniper oil and sandalwood oil to tea tree oil. Now rub the mixture you get to your abdominal region. That would reduce the pain and at the same time kill all the bacteria in your tract. There is no dearth of home remedies for UTI, given how common the problem really is. Almost every one you meet has suffered from a urinary tract infection at one point or the other. The symptoms usually last for a few days and you need to come up with remedies which can help you battle the pain and also speed up the recovery process. These ten home remedies do not require you to go to elaborate lengths; just use items that you already have in your home. So if you or a family member has been diagnosed with UTI, you could try out some of these home remedies. It’s surprising to know a variety of ways to treat UTI! I’ve always been very reliant to cranberries and making my urine more alkaline by switching to the alkaline ash diet. I didn’t like to rely a lot of antibiotics as to avoid resistance to these drugs. I really find your article informative! I definitely agree with you that drinking water and emptying the bladder frequently helps prevent and resolve urinary tract infections.